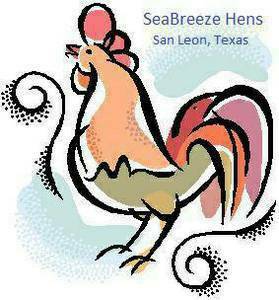 SeaBreeze Hens provides happy, healthy, and hand raised hens, pullets, and chicks on our small farm in San Leon, Texas (between Houston and Galveston). I raise purebred hens and a few roosters that I hatch here and/or arrive at a day old. My chickens and laying hens enjoy free range browsing as well as high protein feed, whole grains scattered for "scratching", and fresh fruits and vegetables. Check out our Schedule for this Week . You are welcome to just stop by during our open hours, but if you give me a call first, you can be sure I will here to help you when you arrive. If you are unable to come at our available times, give me a call and I may be able to arrange to help you at another time. Click here for current chicken availability and prices. We also regularly have pullet chicks and teenagers in French Black Copper Marans, French Wheaton Marans, Crested Cream Legbars, Silver Leghorns, Salmon Favorelles, Black Jersey Giants, Spangled Russian Orloff, Buckeyes, Delaware, Austrawhite, and othermore rare breed pullets available. We occasionally have pullet chicks and teenagers in Exchequer Leghorns, Silver Gray Dorkings, Cream Brabanter, Gold Brabanter, and Rhode Island White. Thanks for your interest in our hens! For more information, please call Melinda at 281-900-0183. SeaBreeze Hens is your premiere provider of happy, healthy, and hand raised laying hens, pullets, and chicks on our small poultry farm in San Leon, Texas (between Houston and Galveston). I raise purebred hens and a few roosters that I hatch here and/or arrive at a day old. My chickens and laying hens enjoy free range browsing as well as high protein feed, whole grains scattered for "scratching", and fresh fruits and vegetables.